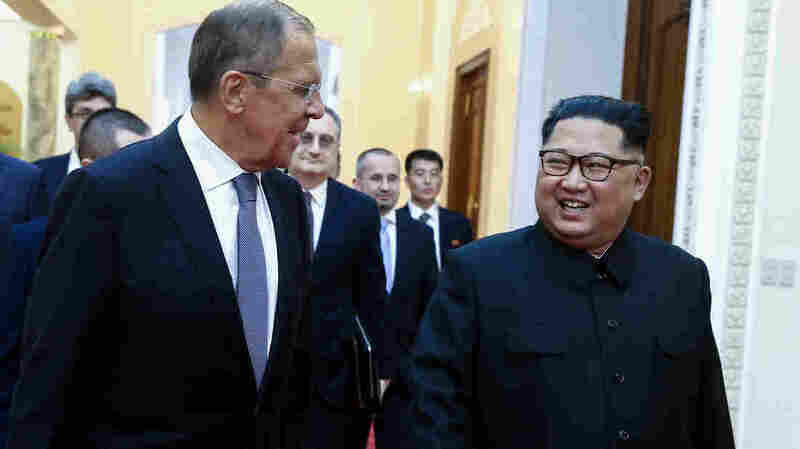 Russia's Lavrov Meets With Kim Jong Un, As Pompeo Tries To Salvage Summit : The Two-Way "I highly value the fact that Putin's administration strictly opposes the U.S.' dominance," Kim said, according to Russia's state-run Tass agency. Russian Foreign Minister Sergey Lavrov walks with North Korean leader Kim Jong Un in Pyongyang during their meeting on Thursday. Russian Foreign Minister Sergey Lavrov is in Pyongyang on Thursday, meeting with North Korean leader Kim Jong Un to discuss the state of talks with South Korea — and inviting Kim to visit President Vladimir Putin in Russia. "I highly value the fact that Putin's administration strictly opposes the U.S.' dominance," Kim said, according to Russia's state-run Tass agency. Kim also told Lavrov, according to Tass: "Your visit comes at a time when the situation on the Korean Peninsula is rapidly moving towards talks and consultations in accordance with the interests of the two countries' people." Instead of being held behind closed doors, much of their meeting took place as photographers snapped photos and filmed the session. Video footage showed Kim, seated next to an interpreter, sitting across from Lavrov and his entourage at a long table. As NPR's Lucian Kim reports from Moscow, Lavrov passed on "warmest regards" from Putin as he invited Kim to visit Russia. "Lavrov's meeting with Kim Jong Un was the first by a senior Russian official since the North Korean leader came to power in 2011," Lucian says, adding that the Kremlin has traditionally had close ties to leaders in Pyongyang. Lavrov's visit to Kim comes as Secretary of State Mike Pompeo is meeting with a senior North Korean official in New York, where they tried to work through recent problems to get the U.S. and North Korea back on track for a June 12 summit between President Trump and Kim in Singapore. Russia's Foreign Ministry says that Lavrov also spoke to Pompeo by phone on Wednesday, the first day of the American's talks with Kim Yong Chol, North Korea's former military intelligence chief. There is no sign yet whether Lavrov discussed his pending visit to Pyongyang with Pompeo; the Russian ministry said the two diplomats "exchanged views on several aspects of the joint agenda," citing the Syrian crisis and Ukraine. Thursday morning, Pompeo said in a tweet that the on-again, off-again summit would bring North Korea "a great opportunity to achieve security and economic prosperity." Pompeo also said he had a "working dinner" with Kim Yong Chol, adding that their menu included steak, corn and cheese. The timing of Lavrov's visit seems to have caught some by surprise: The Russian ministry posted a short public notice about Lavrov's trip on Wednesday, one day before the meeting with Kim. Despite Lavrov's invitation to the North Korean leader, Russian presidential spokesman Dmitry Peskov said on Thursday that it's "too early to speculate" about a Putin-Kim summit. A bas-relief plaque outside of the Russian Embassy in Pyongyang that honors Ambassador Andrei Karlov. A former envoy to North Korea, Karlov was assassinated in Turkey in 2016. Moscow seems intent on inserting itself into the conversation about the future of the Korean Peninsula. The topic came up last week in Moscow, when Japanese Prime Minister Shinzo Abe visited Putin. On the eve of that meeting, Russian Foreign Ministry Spokesperson Maria Zakharova was asked about the Kremlin's push to be included in wider talks on the two Koreas. Zakharova replied that Russia had "planned a number of initiatives," adding, "I think that I will be able to share more information on this subject in the near future."